BEAUTIFUL DETAILS AND DESIGN: Simple, versatile cream serves as the backdrop for intricate dimpled patterns that circle each piece. The elegant look is enhanced with a hint of red along the scalloped edges. VERSATILE DINNERWARE DESIGN: The beautifully detailed design complements any decor and can be used for formal and casual occasions. 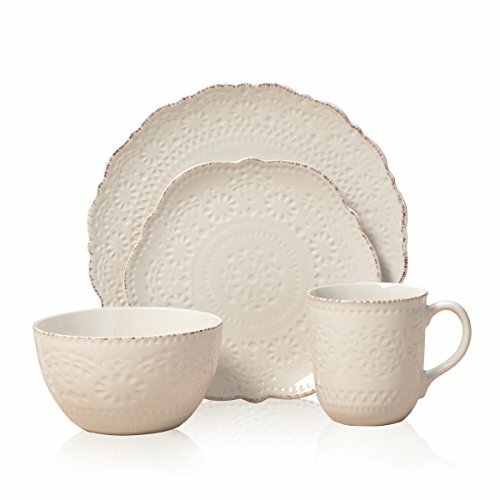 DISHWASHER AND MICROWAVE SAFE: All pieces of this dinnerware set are both dishwasher and microwave safe. View More In Dinnerware Sets. If you have any questions about this product by Pfaltzgraff, contact us by completing and submitting the form below. If you are looking for a specif part number, please include it with your message.